As 2014 ends and 2015 begins, I'm reminded of something senior planetary scientist and New Horizons science team member Rick Binzel said a while back: "It's Pluto Eve!" New Horizons has been awake from hibernation since mid-day on Dec. 6, having completed its almost nine-year-long cruise phase from Earth to "Pluto space." We're currently in the very earliest stages of Pluto approach. Since waking New Horizons, we've been checking out spacecraft systems and some of the instruments, calibrating gyroscopes, collecting trajectory tracking information, and undertaking many other spacecraft preparations before the Pluto encounter starts on Jan. 15. At the same time, our science, engineering and operations teams have been planning and testing spacecraft command loads (detailed flight plans) for the first parts of encounter operations in early 2015. Needless to say, it's been a busy time. When the encounter begins we'll still be very far from Pluto, about 135 million miles (220 million kilometers). We won't get close enough to be at our "BTH" — Better than Hubble —imaging point until mid-May, but there is still a lot to do before then. Throughout January to early-May, we'll be taking essentially continuous data on the interplanetary environment where the Pluto system orbits. We'll do that daily using our charged particle sensors (called PEPSSI and SWAP) to measure both solar wind and high-energy particles, and we'll use the Venetia Burney Student Dust Counter to measure dust-particle concentrations in the inner reaches of the Kuiper Belt. Pluto as seen by the Hubble Space Telescope. We'll also do a great deal of radio tracking of New Horizons using NASA's Deep Space Network to refine our knowledge of the approach trajectory, and we'll use our Long-Range Reconnaissance Imager (LORRI) to take hundreds of pictures of Pluto against star fields to better refine the spacecraft's distance to Pluto. Our navigation teams will use that information to compute burn solutions for midcourse maneuvers we may want to make using New Horizons' rocket engines in mid-March and mid-May. We should know whether the March burn will be needed by early February and we'll keep you posted. January, February and April: A series of better and better approach movies of Pluto and its satellites orbiting around it. 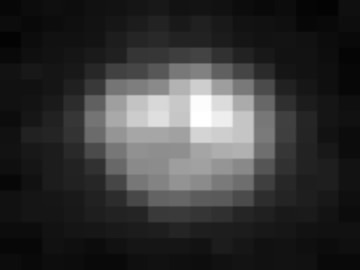 April: Distant color imaging of Pluto and its large moon Charon, and brightness-variation measurements of smaller moons Nix and Hydra as they rotate on their axes. The gap in imaging observations in March has been timed to give our ground teams a bit of a break before the sprint to Pluto encounter from April to July. New Horizons: NASA's First mission to the Pluto system (based on an artist's conception of Pluto by planetary scientist Dan Durda). In all the images we'll take through April, Pluto will just be a few pixels across at most, so the imagery will look like the Hubble images you may be familiar with. Nonetheless, these datasets will provide important science information because they will be taken from angles that can't be observed from Earth, and taken more frequently than observations we typically make from the ground. We plan to release results from these approach observations one to several times each month, at a pace that quickens with time. Back on Earth, from January to April, we'll inspect all these datasets and determine what they can teach us about Pluto and its environment from afar. We'll also be planning encounter command loads for both this period and for May and June, during which the pace of Pluto observations will increase dramatically (as will our resolution of Pluto). And our ground team will also further refine our trajectory information and range-to-Pluto measurements, conduct a final set of instrument checkouts, complete final training simulations for encounter, and build and test some of the software we'lluse to analyze the detailed Pluto-system data that begins flowing home in the later stage of approach in early summer. In early 2015 we also plan to celebrate the 85th anniversary of the discovery of Pluto — made in 1930. More on that soon, too. We've been waiting for 2015 for so long, so I hope you have a safe and joyous New Year's celebration. And until I write again, I hope you'll keep exploring—just as we do!